After a spate of movies in which he played the stylish anti-hero, Ajith plays the typically brave son of the soil in Veeram, directed by Siva, of Siruthai fame. The plot of the movie revolves around Vinayagam (played by Ajith) and his courage and lionhearted stance when faced with adversity.The title ‘Veeram’ is justified well, by Vinayagam’s character. Director Siva and team, have ensured that the movie is not just a showcase of Ajith’s action and heroism but also a good cocktail with healthy comedy and sentiment in good measure. The story of the movie, by Siva and Boopathy Raja, with the above mentioned elements are something that you have seen in numerous movies in the past but director Siva’s packaging makes sure that the movie is enjoyable for Ajith fans and importantly the general family audiences as well. The dialogues penned by Bharathan carry enough punch to make the fights and exchanges memorable and also lend good emotion to the sentimental scenes. 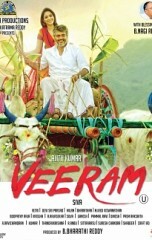 There are plenty of scenes which stand out, be it Ajith’s daredevilry in the train stunt sequence just before the interval or the fight sequence involving a little child or the auction scene (which totally plays to the gallery) or Ajith’s little bullock-cart ride or the sequence where the brothers show their mettle to Pradeep Rawat. Such scenes will indeed stay in mind. Among the lead cast, Ajith earns the maximum brownie points and except the song sequences, he sports a simple white shirt-dhoti throughout the movie. There are two distinct looks for ‘Thala’ and the bearded look in particular suits him very well. Apart from his heroic gait and flourish, he also impresses in the scenes where he tries to be the perfect family man and plays the reluctant lover-boy. Ajith’s performance, be it his dialog delivery or the attitude and authority he displays, is unique to the actor alone. Santhanam is a major presence in the first half and his one-liners keep coming at the audience and incite the laughs, chuckles consistently. He doesn’t spare Ajith’s gray hair too. Thambi Ramaiah is another comedic attraction in the second half and he ends up getting bashed most often, like the quintessential Tamil film comedian. Tamannah looks ravishing in the first half and the song sequences. Nassar eases through this role while the villains are the loud, roaring, grunting ones that we are used to. Ramesh Khanna has a cameo in the first half and so do Ilavarasu and Mayilsamy. Ajith’s brothers in the movie are always spotted together and are literally the brothers-in-arms and the perfect sidekicks for Ajith and Santhanam. Vetri’s work on the camera highlights Ajith’s screen-presence and all the action scenes. His camera has visited some picturesque locales for two of the duet numbers. Silva has choreographed the breath-taking train sequence, which is a major highlight. Among DSP’s songs, the Veeram theme has been used to great effect at the right moments. The intro number and the Thiruvizha song look grand while the two duet songs seem unwarranted. DSP’s re-recording gives the required mush to the dramatic scenes and adds the necessary verve to the heroic scenes. The sequences between Ajith’s brothers and Tamannah’s family in the second half become a stretch. Could have been edited to make it a bit more crisp. The comedy in the second half also doesn’t work as well as the first half. On the whole, Siva and his team have delivered a tried and tested commercial entertainer which banks on Ajith’s screen presence, charisma and entertains for the most part. Verdict: Ajith and Siva dish out a ‘heady’ commercial package for the actor’s fans.